Did you say free? Count us in. Planning a girl's night out with your friends is always fun, but it can also be expensive. Since your boyfriends won't be around to chip in, it's always a good idea to scout clubs that offer free drinks for ladies on certain nights. 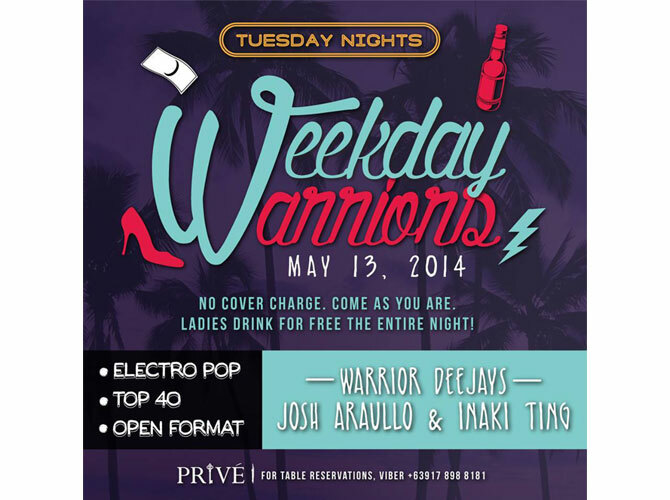 On Tuesday evenings, swing by Prive Luxury Club and be Weekday Warriors as you enjoy unlimited Lychee Martinis and Cosmopolitans (for ladies only!) all night long. Then, let loose and dance to Electro Pop and EDM Top 40 beats. Free booze, good music, and (possibly) cute guys? We know where we're going tonight! See you there! For guest list, contact 0917-827-5616 or 0920-932-9387; For table reservations, Viber 0917-898-8181.